Trueman’s books have appeared here several times. Those reviews all note his English humor, his sharp historical mind, his willingness to call out contemporary evangelicalism for being too quickly taken by contemporary culture and its pressures, they all call for a deeper understanding of historical theology, and they have all been reviewed positively. Put in those terms, this book is classic Trueman. 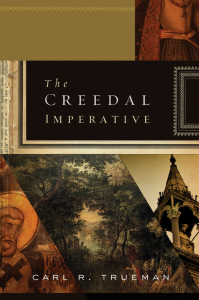 The “creedal imperative” is that the church not only can appeal to creeds in the history of church while also affirming Biblical primacy, but the church needs to do this for its own well-being in an age of diminished and shortened confessions of faith. Trueman goes to great lengths to show that his call for confessionalism is found in Anglican, Lutheran, Baptist, and also his Reformed traditions. Then he explains the importance of words for biblical teaching and the historical, biblical, and practical place for confessions to show us what words are acceptable forms of theology. He also spends several chapters showing the purposes behind historical creeds like Nicaea, Chalcedon, and major Protestant confessions. I can only assert my hearty agreement with nearly everything he writes in this book. One hesitation I have is related to his Presbyterianism as opposed to my Baptist leanings. He seems to conclude at points that the imperative to have creeds includes not only the authoritative status of creeds and confessions but also the necessity of an authoritative body of leaders both within and without the local congregation to enforce these creeds. Obviously my Baptist convictions will push back against this. I would also assert that each local church enforces these things on their own. Not that I disagree with the need for fellowshipping and cooperating churches and the necessity for confessional agreement for this to happen and even for fellowshipping churches to insist on confessional agreement with one another, I simply assert congregational autonomy.